Was the language and invention of The Hobbit inspired by JRR Tolkien’s time at the University of Leeds? Friday, December 12, 2014, marked the end of a very long journey. It was the day the third part of the (some would say cynically elongated for maximum profit) film of The Hobbit is released. That was the sixth and final of Peter Jackson’s films based on John Ronald Reuel Tolkien’s saga of hobbits and dwarves and elves and dragons and ents, and talking, walking trees, which began in December 2001. Then run back through radio dramatisations, and the various paperbacks and hardbacks to the origins of a fantasy that became a giant literary and cinematographic phenomenon. And when did it all begin? 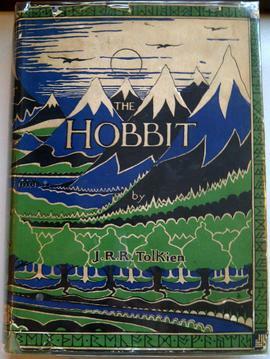 Formally on 21 September 1937, when the Hobbit was first published in hardback by George, Allen and Unwin. He was wrong on that point. It’s a very well-written, and exciting adventure story that appeals to teenagers and adults just as much, as I confirmed to myself, re-reading it recently. And neither he, nor his father, inspired by the review to publish the book the following year, nor the author, who wrote to a friend in 1937 “sales are not very great”, could have forseen the grip this fantasy would exert on readers and cinemagoers around the world. At first the book’s impact was slight. There were several reprints into the first years of the war, then the book retreated into Tolkien-esque shadows. But the writer had a much bigger story to tell. It came in The Lord of the Rings, first published in hardback in 1952. The trilogy was well reviewed, but still the reading public – and remember, there was no TV to distract the reader until the mid-1950s – was slow to buy it. Even when the paperback of the Hobbit came out in 1962, sales were tiny compared with what was to come. In 1968 George Allen and Unwin put on its equivalent of the Ring of Power. It published the Lord of the Rings (LoTR) in paperback. More than 10 years after it was first issued in hardback, Tolkien’s epic story about the quest to destroy the malevolent, all-powerful ring was now on course to become the biggest adventure story of our times. The combined three volume LoTR paperback was a literary sensation that culminated in the release of the Peter Jackson’s film trilogy of the books, followed by the three Hobbit movies. So it is appropriate to go back well before 1936 to find out what nourished that imagination. Most people would assume it all happened in Oxford. And that indeed is where much of his Middle Earth-view did develop. He went there in 1925, to become Professor of Anglo-Saxon, a post he held until 1945. But do we overlook the inspiration he may have taken from his earlier posting, at the University of Leeds? After all, it was only three years after he left the northern city, where he was reader in English Language, then a professor, when he is believed to have written the first line of The Hobbit on an exam candidate’s paper: “In a hole in the ground, there lived a hobbit”. J.R.R. Tolkien was born in South Africa in 1892. He was educated in Oxford and fought in the First World War. After working on the Oxford English Dictionary, in 1920 he came to Leeds University, aged 28, to develop the linguistic side of the syllabus in the School of English, Some aspects of the syllabus he developed, such as Medieval Welsh, which he introduced to Leeds, were still taught 80 years later. We will never know, but it would be nice to think that he turned over the first roughly-sketched notions of the world of elves and dwarfs on the No. 1 bus, riding down Otley Road and Headingley Lane, then down Woodhouse Lane on his way to work. Perhaps they were light relief from some abstruse details of Old and Middle English Philology, or second year Old Icelandic and Medieval Welsh.Perhaps he drew linguistic inspiration from, for example, the work of the Yorkshire Dialect Society, of which he was a member. At least one local name, wetwang (a wet field, marshy place), made it into the Lord of the Rings.